Only 38 new-build freehold apartments (studios to 3-bedroom units) in this high-end new development (2 chalets, 4-storeys each with underground parking) in Saint-Gervais only 100m from piste and just across the road from Le Bettex main lifts (Evasion Mont-Blanc ski domain, see our other new developments). Also you are only 7 minute-walk from the centre of town with its restaurants, bars, shops and supermarkets! Only 38 new-build freehold apartments in this charming new development (2 chalets, 4-storeys each with underground parking) in Saint-Gervais only 100m from piste and just across the road from Le Bettex main lifts (Evasion Mont-Blanc ski domain, see our other new developments). Also you are only 7 minute-walk from the centre of town with its restaurants, bars, shops and supermarkets! New express train network between St Gervais and the Geneva area and airport in construction for 2019. The dwellings range from the studio to the 3-bedroom extensive apartment (contact us for availability), each with private parking, fully-equipped kitchen; cave/ski locker (choose your favourite materials for the floors, walls kitchen and bathrooms). Surfaces of these ski properties are very generous and many of the units come with extra bedroom or coin montagne therefore extending the sleeping capacity. Some of the apartments also come with extensive private terraces and balconies and also wood-cladded interior walls for that Alpine feel. 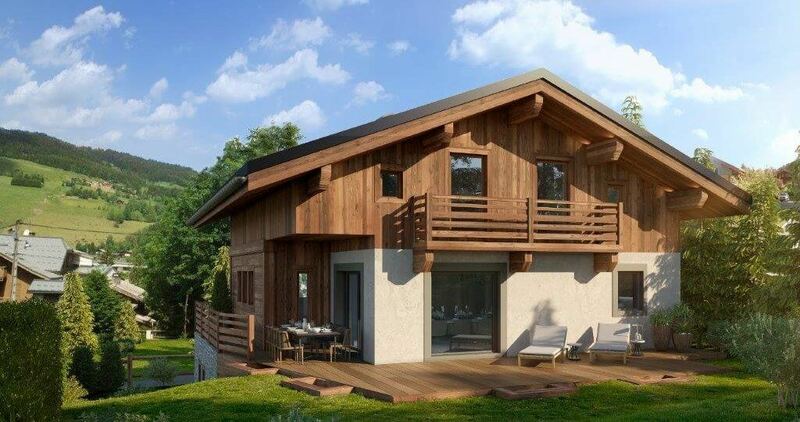 If you love skiing in Megeve ski area and love waking up to the views of Mont-Blanc but would rather relax in a traditional mountain town with plenty of shops and restaurants all year round or simply if you cannot afford the prices of Megeve, this new development is ideal for you. -Choices for floors, walls or kitchen and bathrooms are varied and included in purchase price. -Ideal base for Mont Blanc country, 15 minutes from Chamonix. Make an appointment to visit the showroom and visit some of the already completed chalet apartments by developer. Everything is thought out for you to enjoy your apartment not only after a hard day on the pistes but also in summer with the superb terraces and the wide windows which bring the Savoie light into your dwelling. Interiors are also thought out carefully with open-plan fully-equipped kitchens (ceramic hobs, fridge, extractor hood and also dishwasher and washing machine connections for some of the apartments), underfloor heating for these cold winter nights, spacious living/dining room area, plenty of storage in all of the apartments. -Bicycle shed and parking in development. “A top location across from main Saint-Gervais lifts in a town which is very well linked to Geneva area including airport (soon new express train network will link St Gervais to Geneva area inc. airport). High-end options included in price, no need for upgrades. Imagine miles and miles of ski runs stretching from 580m to 4808m altitude, authentic alpine chalets and beautiful pine forests. The Evasion Mont Blanc ski area is simply wonderful. It covers an area stretching between the resorts of Megève, Saint Gervais, Saint Nicolas, Combloux and Les Contamines. Sheltered by the highest peak in Europe, there are no less than 450 km of mapped ski runs on offer to suit all tastes and styles of skiing.